Traveling through the coastal towns of Maine it is easy to become enchanted by the views crafted by years of weathering, carved by the salty sea. The unique people who inhabit these communities capture their histories in a timeless experience—one they will readily share with you. Fishing, lumbering and quarrying are classic elements of the heritage of this region and we sometimes find tributes to these in unusual places. 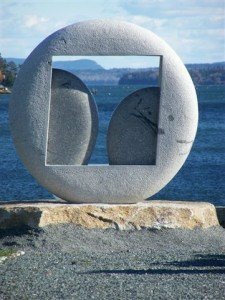 Perhaps the most surprising tribute is the Sculpture Trail, the proud result of a decade long effort to bring public contemporary sculpture to Downeast Maine. You would not know it by looking at the towering sculptures created through the organization’s efforts, that the whole idea was started by a young man who grew up in the very rural town of Steuben, Maine. Supported by friends, family and partnering communities, Jesse Salisbury’s vision resulted in the Schoodic International Sculpture Symposium, which now boasts 27 large scale granite sculptures made by world renowned artists on a trail that spans over 270 miles. The Schoodic International Sculpture Symposium is a biennial event, the fifth of which takes place this summer from August 3 through September 14, 2014. This event is free and open to visitors during the six week carving process. Watch as large blocks of Maine granite are transformed into sculptures and installed in sponsoring communities by the end of the event. To say that this trail is a credit to the empowering effects of art is an understatement. It is a vision created by a community, and a partnership with an artist who is tasked with absorbing the community’s culture into a three dimensional form. The result is a large scale granite monument—sometimes realistic, sometimes abstract—but always unique to the landscape for which it was created. While visiting the natural beauty of our quiet coast, stop at the occasional public green and you might find one of these surprising pieces of artwork. The granite is local, pulled from quarries and carefully transported to the outdoor studio event. International artists work alongside Maine sculptors to carve our representations of their imagined forms, in a mere six weeks. Each sculpture has a story, one you can read about online at www.schoodicsculpture.org. An electronic version of the Sculpture Tour map and guide is available online as well. 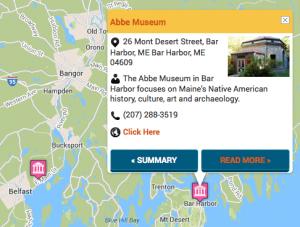 Take advantage of the cultural opportunities of our coastal communities by traveling along the Bold Coast and Schoodic Scenic Byways, and visit local business along the way that capture the spirit of the people who live here. Walk along the rocky beach at Roque Bluffs State Park or stroll through downtown Eastport, and discover the numerous trails that tie these unique spaces together.